When it comes to summer fun, there’s nothing better than a nice swim in a lake or pond or something else fun, cool, and refreshing. However, swimming has dangers inherent into the activity. For one, there’s the risk of drowning. Now, apparently, there’s a secondary risk that’s pretty obscure, but has a 95% fatality rate. It is Naegleri fowleri, a rare amoeba that lives in warm fresh water that attacks the brain, causing death. 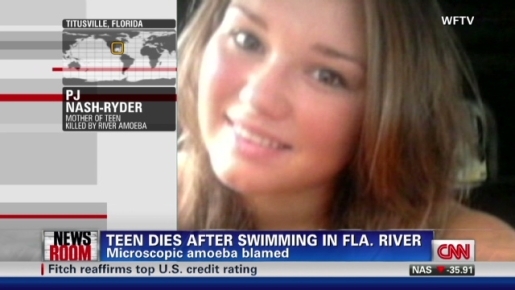 The brain-eating amoeba is blamed for three deaths in 2011. Fortunately, Naegleri fowleri doesn’t deliberately attack humans, and it is not a parasite as of such. It is usually introduced into humans when water is forced up the nose, and it generally lives in warm water. So if you wear nose plugs, don’t swim in untreated fresh water (no matter how cool the river looks), and avoid stirring up the sediment on the bottom of the lake or river where the amoeba generally lives, you should be okay. After all, only 32 known infections have occurred over the past 10 years, which is pretty good odds.